European Championship Shinkyokushin weight categories 2019 – counting down! Once again, the line-up and the support of the championship are at its best. It is clear now that the Shin EC are stable at the top. Comparing to others, the number of fighters in categories and not at least their proven level puts these EC trophies in the category “Most wanted” This edition we have an EC with over 225 contenders only seniors, only fighters from the European region. WKO/EKO are one of the few that manage to fill their categories at a respectable level when it comes to high status tournaments. -55 kg coming up! In this category only one fighter from last top 4 remains. Lithuania, Poland(x2) and Hungary was top four last year. Anna Bielska / Poland, the runner up from 2018 will naturally be one to point out. Several top positions in different tournaments – and also being the U-22 European Champion from 2017. Almost all top nations in Europe are to find. Ukraine, Spain, Lithuania and Poland do all fill their number of fighters and besides that Bulgaria, Hungary, Croatia and Belarus with one fighter. As we mention Belarus. (In this category Ekaterina Yushkevich) A nation that bring in six fighters this year, and if not mistaken, Belarus have not been seen in that matter the last years. This will spice up the EC even more! – Ekaterina Yushkevich if someone wonder, first year senior, young promising fighter, took the KWF World Championship title in 2018 (-60, 16-17 years) That said we will dare to say that it will be a harder day at the office this time. 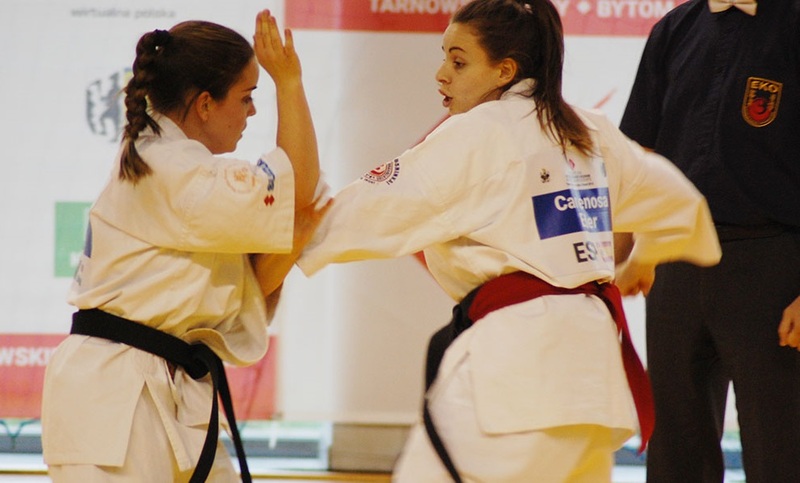 We mentioned Bielska from Poland, the second fighter, Agata Kozubowska, qualifying by winning the qualifying tournament in Poland. That alone require a very high level, the competition is hard and one cannot do mistakes. Among the three fighters from Lithuania, the favorite mark will less dominant than usually. The winner of the Lithuanian national, and the first choice was Gerda Pekarskaitė. For some years, she lived in Sweden, and had her fighting carrier there. Sweden a strong Kyokushin nation had her as a national team member before Lithuania became her national team (and home) again. have been on the podium in the U-21 category. Gerda Pekarskaitė could be one that enters the podium, 1-3rd – that is hard to say. Spain have two fighters, Eider Cardenosa and Uxue Lopez de alda. Spain have good technical fighters, and these two are no exceptions. Cardenosa would be the one to pick, based on previous merits. She made it into 3rd place in Georgia back in 2016. A point would be that this year Cardenosa enter -55kg category, previous it has been the category below. Lost her first fight last year against Veresniak, regained her drive with two wins in the Open-weight in November. Handful fighters are young up and coming fighters with merits from junior and U22/21 categories. These fighters are well prepared, and no doubt that the recruit system works. Anastasiia Pokotylo / Ukraine are one of them. She is the reign U21 European Champion 2018, and from the same podium Kata Rita Dezso / Hungary and Nika Jakobović / Croatia. All these three will now meet in the senior EC. The biggest question will be how they hold stand against the established fighters.